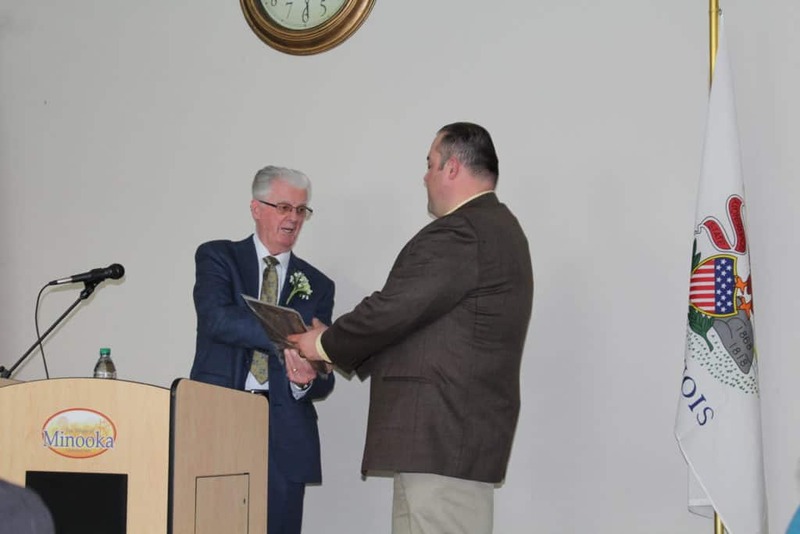 MINOOKA – The Channahon Minooka Chamber and the Village of Minooka partnered to present the State of the Village Address April 10th in celebration of the village’s 150th Anniversary. With a record breaking 135 people in attendance including village officials, business leaders, elected officials and residents, the address was held in Minooka Village Hall’s Community Room. Over lunch the audience hear Mayor Patrick Brennan share stories and photos of Minooka’s long history. The village and the Channahon Minooka and Grundy Chamber partner for this event every year. Brennan shared then and now photos of downtown Minooka and local churches. He also highlighted the village’s successes in 2018 including a balanced budget, almost 100 new home construction permits and the construction of Kellogg 700,000 square foot expansion across the street from its existing one million square-foot facility. This $30 million investment will employ about 200 workers, he said. The mayor ended the presentation highlighting Aux Sable Springs Park Project. “The $41.8 million project will not only open up a new 120 acre park to the residents of Minooka, but also help protect the pristine waters of the Aux Sable Creek that was here long before Minooka was founded,” Brennan said. As part of the annual State of the Village address, the village recognized an Officer of the Year – Detective Ryan MacDonald. The Chamber presented the village with a plaque for its 150th anniversary thanking the village for its support of the Chamber and the business community. “The village of course looks vastly different than it did more than a century ago, but many of the principals that make Minooka a great place to live, work and call home are the same today. Neighbors look out for each other, the village board and employees keep their residents at the forefront of all decisions, and the heart of Minooka is its community,” Chamber Executive Director Christina Van Yperen said while introducing Brennan. The Chamber partners with the local municipalities to better the business community. For more information on the Grundy County Chamber call 815-942-0113 or visit grundychamber.com.